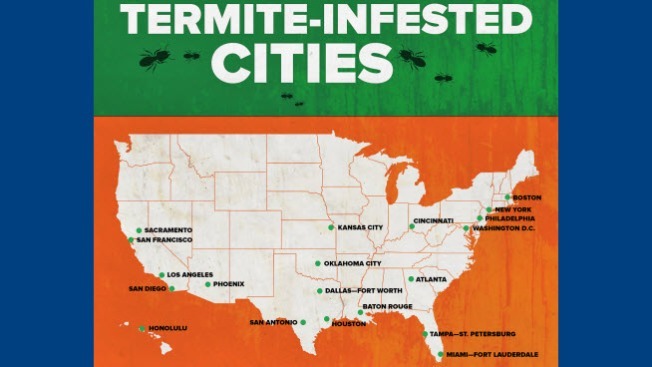 Map of the top 20 most termite-infested cities in the United States. San Francisco ranked among the most termite-infested cities in the United States, according to pest control service Terminix. In this year's study, San Francisco placed second as the most termite-ridden city. In 2014, San Francisco placed No. 8 on the list. Cities in California topped the list, placing in four out of the 10 top spots. Los Angeles topped the list, while San Diego came in fourth. Sacramento placed ninth. "Termites thrive in warm, moist environments, making southern states like California, Texas and Florida the perfect environment for their destructive behavior," said Doug Webb, who is a Terminix technical specialist and termite expert. "But living elsewhere doesn't mean you're safe. Termites are active in all 50 states except Alaska, and regularly cause thousands of dollars of uninsured damage across the country." The average cost of damage because of termites is $8,184, according to a study from Harris Interactive. And that damage is not covered by insurance.